San A Bel in North Myrtle Beach, South Carolina has everything you and your family could want in a North Myrtle Beach vacation condo rental location. Relax oceanfront in a two-bedroom, two-bathroom, spacious North Myrtle Beach condo that can comfortably accommodate up to six people. At this North Myrtle Beach resort you will enjoy wonderful amenities and breathtaking views of the Atlantic Ocean. San A Bel vacation rentals are located at 1709 South Ocean Boulevard in North Myrtle Beach, South Carolina. This North Myrtle Beach resort sits oceanfront with incredible views of the Atlantic Ocean in the Crescent Beach section of North Myrtle Beach. San A Bel is only a few short blocks away from Highway 17, the highway that will take you to everything that North Myrtle Beach has to offer. And with having to only take a few steps from your North Myrtle Beach condominium to have you feet in the white sandy. You will be close enough to have the best of both words in North Myrtle Beach without having to go far from your North Myrtle Beach condo rental. At San A Bel you will find a beautiful indoor swimming pool for you and your family to enjoy. Not only is this swimming pool sparkling and inviting it also has a beautiful oceanfront view. As you swim and relax with the family you will be able to look out a large floor-to-ceiling glass window for a spectacular view. 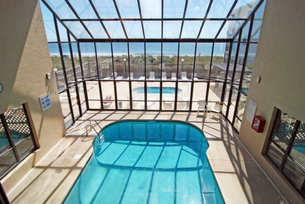 Enjoy watching the clouds roll by in the blue sky and look out into to ocean when you swim in the indoor swimming pool at your North Myrtle Beach vacation resort. Above the sparking swimming pool you will find a fitness room. This fitness room has everything you need to keep up with your cardio and weight lifting training. Keep up your normal workout routine during your North Myrtle Beach vacation. From the fitness room you will be able to look out and see the swimming pool below and enjoy the view of the bright blue sky and the Atlantic Ocean. Step outside of your North Myrtle Beach vacation resort and you will find a beautiful outdoor sun deck with a hot tub to soak in after an exciting day exploring North Myrtle Beach or a game of Myrtle Beach golf. There are also multiple lounge chairs for you to relax in and enjoy the sun. Socialize in some shade at a table by the hot tub while enjoying the ocean breeze. Just around the corner of the hot tub you will find an area for grilling. You will find a few picnic tables and grills for your use. Enjoy an ocean view and a family meal outside under the South Carolina sun at your North Myrtle Beach condo rental. Elliott Beach Rentals is not affiliated with onsite management or the HOA of San A Bel.